The list of famous fans attending November’s Carrier Classic on the Carl Vinson keeps on getting longer. The latest to commit to the game is President Obama, who has accepted an invitation to attend the matchup between North Carolina and Michigan State, the AP reported today. Earlier this week, Hall of Famer and UNC alum James Worthy was announced as North Carolina’s honorary captain for the game. Worthy’s fellow “Showtime” teammate Magic Johnson, an MSU alum, had previously agreed to be the Spartans’ honorary captain. Navy Secretary Ray Mabus will also be in attendence. The Veterans Day game on the Vinson is the first college basketball game to be played on an aircraft carrier. Vinson became famous in May when the body of Osama bin Laden was dumped off the deck and buried at sea after Navy SEALs killed killed the notorious terrorist in Pakistan. Obama is big hoops head, and he has some history with UNC. 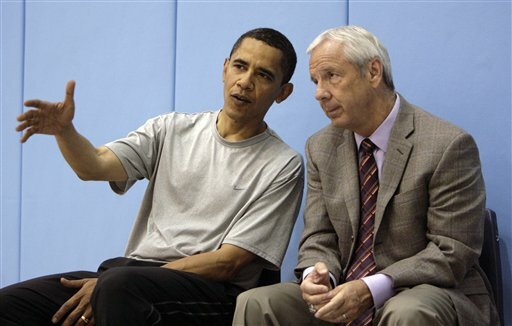 As a candidate for office in 2008, he broke out the sweatpants and dropped in on the Tar Heels in Chapel Hill for a little scrimmage with the team (leading to this somewhat awkward photo). Later that same season, after becoming president, he went on ESPN and picked UNC to win the national championship — which they did, against Michigan State (Obama had picked the Spartans to lose in the Elite Eight). Mr. Obama was great in this game. Drew gotta believe that it’s gotta be the sweat pants that gets him flying so high. His will exceeds his skill, and frankly, his skill is considerable.